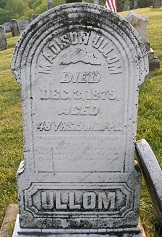 Madison Ullom was born on March 20, 1831 in Greene County, PA, the son of Peter and Hannah Matilda (Kinney) Ullom. He was a carpenter and undertaker, and was married twice, producing children with both wives. Madison's first bride was Sarah Gray (1833-1867). They were married on June 29, 1852, when he was age 21 and she 19. They had seven children -- David Maxwell "Max" Ullom, George Washington Ullom, Catherine "Katie" Strawn, Hannah "Jane" Hughes, William G. Ullom and two who died in infancy. Heartache shook this family in the early days of the new year in 1867. Sarah passed away at the age of 34, on Jan. 3, 1867, leaving her husband with four children under the age of 10. With the brood of children to raise and feed, Madison did not remain a widower for long. Later that year, just under nine months since Sarah's death, the 36-year-old Madison remarried, to 18-year-old Melissa Ann Hupp (1849-1920). Their nuptials took place on Sept. 1, 1867. Melissa was the daughter of distiller Isaac J. and Eliza (Johns) Hupp of New Freeport, Greene County. She was born on New Year's Day 1849 in the Greene County seat of Waynesburg. In her youth, she was baptized in the Baptist church by Rev. Lewis Sammons. The couple went on to produce five more children -- Eliza Ann McCracken, Isaac Bailey Ullom, Susan Clara Grimm, Lantz Hupp Ullom and Thomas Homer Ullom. The Grim Reaper claimed another life in this clan in 1869, when son William, from the first marriage, died young. His tender remains were placed at rest beside his mother in the Windy Gap Church Cemetery. A red star marks the location of Madison's home and cabinet shop southwest of Aleppo. 1875 Atlas of Greene County. In 1875, the Ulloms made their home to the southwest of the village of Aleppo, Greene County. Living nearby on large farms were Madison's father and brothers Harrison and David. Their next neighbor to the north was Thomas Hinerman Jr., and one of the Ullom sons later married one of the Hinerman daughters. Their farm is believed to have comprised about 100 acres. The specter of death again visited this family after Madison and Melissa had been married for a dozen years. He became seriously ill and wrote his last will and testament on Dec. 1, 1879. He directed that his married daughter Catherine Strawn receive a one-quarter share of the 100-acre family farm, with the remaining acres to be shared between the other children from the first marriage. He also bequeathed a grey horse to his son Maxwell and a bay mare to son George. He also stipulated that Melissa receive one-half of the wheat in the ground, with the sons from the first marriage to have the other half. Melissa was to inherit everything else. Unable to write his name, he signed the document with an "X." Madison passed away just two days later on Dec. 3, 1879, at the age of 47. The cause of his untimely death is not known. Madison's death left Melissa as a widow at the age of 30 with four stepchildren ages 14 to 21 and five children of her own ages one to 10. Her youngest two sons, Lantz and Thomas, likely had no memories of their father. At the time of death, Madison owned 230 acres, and was assessed taxes for three horses and three cows. Melissa remained a widow for two years. On Sept. 7, 1881, at age 32, she remarried, to 22-year-old Christian Grim (1859-1929), a neighbor of Aleppo, and the son of Jacob and Kezia (Courtwright) Grim. Christian was a decade younger than his wife, and in fact was a year younger than his eldest stepson, Max Ullom. They had four more children -- Flora Snider, John C. Grim, William P. Grim and Eleanor G. "Ella" West. Christian was the son of Jacob and Keziah (Courtwright) Grim of Greene County, and a prominent farmer and stock grower. The Waynesburg Democrat Messenger said he "spent all of his life [in Aleppo] as a farmer and stockraiser. he was a member of the Church of God and was one of the most highly respected men of the Aleppo district." He and Melissa resided together for many years until Melissa's death in 1920. Thus, between Madison's two marriages and Melissa's two marriages, some 15 children were produced. But the Angel of Death continued to do its destructive work, claiming Christian and Melissa's son John on Aug. 15, 1899, at the age of 15. His remains were placed into repose at the Windy Gap Church. Christian was profiled in the 1888 book History of Greene County, Pennsylvania, Illustrated, authored by Samuel P. Bates and published in Chicago by Nelson, Rishforth & Co. In the profile, he was praised as "a successful farmer, and has the management of his own and Mrs. Grim's farm, amounting in all to 250 acres." Another reference in the book shows that this farm originally had been owned by Anderson Hinerman. They belonged to the Church of God, where Christian served as a deacon. Politically, Christian was a Democrat. The federal census of 1910 shows Christian and Melissa living in Aleppo with their 21-year-old son William and 10-year-old grandson William H. Ullom. Grandchildren recalled visiting the Grim farm and sneaking cookies and other sugary treats. At some point, by 1914, the Grims retired and moved across the state line to Cameron, Marshall County. The 1920 federal census of Cameron shows them living there on North Avenue, next door to their married daughter Flora Snyder. In June 1919, Melissa and Christian traveled to Marysville, OH for a visit with their granddaughter, Mrs. Richard Hervey, with the news covered in the gossip columns of the Marysville Journal-Tribune. Melissa died in her home in Cameron on July 13, 1920 at the age of 71. She was placed into eternal rest in the Windy Gap Cemetery. An obituary in the Waynesburg Messenger said "She was the last of a family of eight children...."
Christian outlived his wife by nine years. He married again, to Della Weimer ( ? - ? ). Suffering from heart problems, Christian passed away in 1929 at the age of 69. He was interred beside his first wife following a funeral in the Windy Gap Presbyterian Church led by Rev. V.K. Betts. An obituary in the Democrat Messenger reported that he was survived by three children; five step-children; a brother Jacob Grim of Rices Landing, Greene County; a half-brother John Riggle of Aleppo; and named sisters or half-sisters Mrs. Samuel King of Cameron and Mrs. George Kuhn of Cashion, Oklahoma. Snapshots believed to show Christian Grim with stepson Lantz Hupp Ullom, above at far right, and below at center, locations unknown. Son David Maxwell "Max" Ullom (1858-1931) was born on Oct. 16, 1858 in Greene County. He married Ara Belle (or "Anabel") Smith (1858-1892). They produced five children, including Lillie Archer, Harry Ullom, Bertha Edgar, Robert S. Ullom and Emma Ullom. They were farmers, residing at Beham, Washington County, PA. Sadly, Ara Belle died at the age of 34 on May 30, 1892. Max outlived his wife by almost four decades. In 1893, he married again to Sue Ann Hertzog (July 4, 1858-1931) on June 13, 1893, when Max was age 35 and she 34. She worked at the time as a kitchen maid in Behm, and was the daughter of Solomon and Sarah (Berry) Hertzog. The ceremony was celebrated at the home of the bride's parents in West Finley Township, Washington County, led by Rev. E.K. Bailey. They resided on a 159-acre farm in West Finley Township, near the West Virginia state line and the community of Dallas, WV. Sue contracted a deadly case of influenza and bronchial pneumonia and succumbed at the age of 72 on Feb. 23, 1931. Max only outlived his second wife by a few months. Having suffered from hardening of the arteries, he was stricken with a cerebral hamorrhage at the age of 72 and passed into eternity, apparently at home in West Finley, on May 25, 1931. His remains were placed into repose in Dallas, WV, rejoining Sue in death. Harry Ullom of West Finley signed the death certificate. The Ullom farm was advertised to be sold at auction. When the highest bid was only $27.50 per acre, reported the Monongahela (PA) Daily Republican, the heirs refused to allow the sale. Daughter Lillie Ullom married (?) Archer. She died on April 23, 1964. Son Harry Ullom (1880-1960) was born on June 4, 1880, a twin with his sister Bertha. He grew up as a laborer on his father's farm in West Finley, Washington County, and resided there as an adult. Harry married Samantha Belle Clark (Aug. 2, 1881-1956), a native of Cameron, Marshall County, WV and the daughter of Thomas B. and Virgniia (Smith) Clark. At some point, they relocated to Harrison County, WV, where he worked as a driller in the natural gas industry. The Ullom home in 1935 was Clarksburg and in 1940 in Simpson. Circa 1956, their address was 429 Grand Avenue in Bridgeport. Sadly, Samantha Belle died following a cerebral hemorrhage in St. Marys Hospital in Clarksburg on May 7, 1956. Harry spent his final years at 503 East Main Street in Bridgeport, Harrison County. Suffering from hardening of the arteries, he was felled by a heart attack and died at the age of 80 on July 15, 1960. T.R. Ullom of Springfield, OH was the informant for the West Virginia death certificate. Interment was in the Bridgeport Cemetery. Daughter Bertha Mae Ullom (1880-1931) was born on June 4, 1880, a twin with her brother Harry. She grew to womanhood in West Finley, Washington County. At the age of 21, on Nov. 29, 1901, she wedded J. William Edgar ( ? - ? ) of West Alexander, Washington County. Justice of the peace M.E. Ealy officiated at the ceremony. The Edgars dwelled in Claysville, Washington County. Tragically, on April 9, 1931, when Bertha was age 50, she was struck by an automobile on the National Road, U.S. Route 40, four miles east of Claysville. Having suffered a fractured skull in the accident, she was rushed to Washington Hospital, where she succumbed. Burial was in West Alexander Cemetery. Son Robert S. Ullom (1884- ? ) was born in April 1884. Daughter Emma Ullom (1886- ? ) was born in November 1886. Son George Washington Ullom (1860-1904) was born on Dec. 13, 1860. He wed Belle "Bella" Elbin (Nov. 1863-1950), daughter of J.T. and Hannah (McVey) Elbin of Aleppo. He made his living as a salesman. Sometime between 1898 and 1900, they relocated to a farm in Clay, Wetzel County, WV, as shown in the 1900 federal census. Their eight children were Oscar W. Ullom, Harley Edna Kuhn, Herbert E. "Bert" Ullom, Goldie Black, Ray Ullom, Edith Wiant and Glenn Dewey Ullom. George passed away in 1904. Belle survived for another 46 years. In May 1908, living in Cameron, Marshall County, WV, she purchased a 14-acre farm in Marysville, Union County, OH, near her niece Mrs. John C. Campbell, "a little north of the fair grounds ... [and] about a mile north of the County Infirmary," reported the Marysville Journal-Tribune. By 1920, she had moved to Phoenix, AZ. When her son Herbert became deathly ill in Colorado Springs in 1920, Belle made the journey to be at his side. But when he died shortly afterward, she was ill and could not make the trip to Ohio for the funeral and burial. By 1943, she had relocated to Long Beach, CA. She died on June 23, 1950. Son Oscar W. "O.W." Ullom (1884- ? ) was born in Oct. 1884 in Pennsylvania. He wedded (?) Prosser ( ? - ? ), daughter of R.L. Prosser of Kentucky. In 1911, he was employed in Richwood, OH at the Carmean Store. Then in 1913, having completed studies in the Koester School of advertising salesmanship and window trimming in Chicago, he accepted employment with a department store in Clarinda, IA. His home in 1920 was in Bluffton, IN. Daughter Harley Edna Ullom (1886-1944) was born on Jan. 2, 1886 in Aleppo Township, Greene County. She was wedded to Joseph D. Kuhn ( ? - ? ). The Kuhns dwelled in Aleppo circa 1920. Circa the mid-1940s, they made their residence in Israel Township, Preble County, OH. Harley was stricken with breast cancer in 1944, and she was unable to rally. After suffering a fractured left femur, she died at age 59 on April 28, 1945. Interment was in College Cemetery. Son Herbert E. "Bert" Ullom (1887-1920) was born on Nov. 2, 1887 in Aleppo Township. He came to Marysville, OH with his mother circa 1908. He worked in Marysville with Standard Stamping Company and was a member of the Congregational Church. In the late winter of 1914, he traveled widely in Oklahoma and Texas, probably looking for employment or investment opportunities. But he returned to Marysville, where in April 1914 he acquired the real estate portfolio of a local insurance firm, Bown Brothers. Reported the Marysville Journal-Tribune, he "will represent locally about a half dozen prominent fire insurance companies and will give his entire time to the business. He will write both farm and town property, also having the agency for the National Livee Stock Insurance Co., which insures live stock against death from any cause." Then, in 1914, he moved to Oklahoma to accept employment with Sinclair Oil and Gas Company. But suffering from a long illness, he left Sinclair Oil and relocated to Colorado Springs, CO with the hope of regaining his health. Writing to old Marysville friend Joseph Staggs in January 1920, in a letter summarized in the Journal Tribune, hhe said that temperatures had been "30 below zero at Colorado Springs twice this winter, and there has not been much snow there, but lots of it in the mountains. Mr. Ullom says he has not worked for about a year, as his health went bad, but he hopes to be able to work before long." Sadly, he died in Glockner Hospital in Colorado Springs on Dec. 20, 1920, at the age of 37. His remains were returned to Marysville to rest in Oakdale Cemetery. Daughter Goldie Ullom (1889- ? ) was born in June 1889 in Pennsylvania. She was united in holy matrimony with E.R. Black ( ? - ? ) and lived in Cleveland, OK in 1920. Son Ray D. Ullom (1891- ? ) was born in Dec. 1891. Circa 1910, living near Marysville, Union County, OH, he served as a delegate from the Congregational Society to the State Young People's Society of Christian Endeavor meeting in Cincinnati. He dwelled in Clarinda, IA in 1914 and by 1920, he made his residence in St. Paul, MN. Daughter Edith Ullom (1893- ? ) was born in Sept. 1893 in Pennsylvania. She married Bert Wiant ( ? - ? ) and resided in 1920 in Columbus, OH. In June 1964, she attended the 50th anniversary dinner of the Marysville High School Class of 1914. Son Glenn Dewey Ullom (1898- ? ) was born on April 13, 1898 in Pennsylvania. He wedded Cecile ( ? ). In 1920, he dwelled in Marysville, Union County, OH. Circa 1926, he was employed as a chemist in Columbus, Franklin County, OH, and in 1928, their address was 816 Bellows Avenue. Glenn contracted a nagging case of pulmonary tuberculosis, which he was unable to shake over a five-year span. At the age of 30, on New Year's Eve 1928, he succumbed. Interment was in Marysville, OH. Bert Wiant of 706 South Warren Avenue was the informant for the official Ohio death certificate. Daughter Catherine "Katie" Ullom (1854-1878) was born in about 1854. She married Levi Muncy Strawn (May 8, 1847-1937), the son of Jehu Henry and Margaret Jane (Shaw) Strawn. Sometime between 1870 and 1873, the Strawns migrated to Iowa, settling on a farm in Virginia Township, Warren County. They produced these four known children -- Dora May Hadley, John Strawn, Ella Strawn and Effie Jane Shutt. Katie is believed to have died on Oct. 18, 1878, at the age of 24, and to rest in New Virginia Cemetery in New Virginia, Warren County, IA. Her death left Levi with four young mouths to feed. Levi married twice more. His second bride, circa 1880, was Margaret J. "Mattie" Heaton (June 1851-1899). One source claims that she died in 1899, at the age of 48. Another, the 1900 federal census, shows her living with Levi in Warren County. His third and final spouse was Emma (?) (1866-1938). He died at age 90 on Oct. 18, 1937. He rests with Emma in New Virginia Cemetery. Daughter Dora May Strawn (1870- ? ) was born in about 1870 in Greene County, PA. As a very young girl, she traveled with her parents to Iowa to establish a new life. On Feb. 24, 1889, at the age of 18, she wedded 24-year-old Alphonso Hadley (1865- ? ). He was the son of Simon and Mary M. (Griffith) Hadley of Guthrie County, IA. The ceremony took place in Clarke, IA. The couple produced these known children -- Simeon Earl Hadley, John W. Hadley, Esther Agnes Harlan, Vera Hadley, Lela Hadley, Glen Hadley and Harold Hadley. They were farmers and Alphonso also earned a living as a real estate agent. In 1910, they were in Washington Township, Warren County and by 1920 made a home in Lincoln Township, Warren County. Circa 1940, when the federal census enumeration was made, she was widowed and lived alone in Indianola, Warren County. Grandson Simeon Earl Hadley (1891- ? ) -- perhaps also known as "Simon" -- was born in about 1891 in Iowa. On New Year's Day 1913, in a ceremony held in Indianola, Warren County, he wedded Arbie N. Clark (1892- ? ), daughter of Augustus and N.e. (Funk) Clark of Marion County, IA. Grandson John W. Hadley (1892- ? ) was born in about 1892 in New Virginia, IA. He was married on Feb. 26, 1913 to Fannie F.I. Frazier (1894- ? ), daughter of Thomas and Rhoda S. (Carey) Frazier of Indianola, Warren County. The ceremony took place in Indianola. Granddaughter Esther Agnes Hadley (1893- ? ) was born in about 1893 in New Virginia, Warren County. When she was 21 years old, on Feb. 4, 1914, she was wedded to Glen Harlan Tomlinson ( ? - ? ), son of Alfred Harlan and Rhoda Alice (Ozbun) Tomlinson, of Plattsmouth, NE. The nuptials were held in Indianola, Warren County. Granddaughter Vera Hadley (1898- ? ) was born in about 1898 in Iowa. At the age of 22, in 1920, she was a teacher in a local high school in Warren County. Granddaughter Lela Hadley (1901- ? ) was born in about 1901 in Iowa. When she was 19, she was employed as a store clerk in or near Lincoln Township, Warren County. Grandson Glen Hadley (1904- ? ) was born in about 1904 in Iowa. Grandson Harold Hadley (1914- ? ) was born in about 1914 in Iowa. Son John M. Strawn (1873- ? ) was born in about 1873 in Warren County. On Feb. 16, 1898, at the age of 25, John was united in holy matrimony with 19-year-old Nellie C. Bumbarger (1879- ? ), daughter of George and (?) (Rundall) Bumbarger of Warren County. The Strawns were farmers. In 1910, federal census records show them living on a farm in Jackson Township, Warren County. Their known offspring were Ernest G. Strawn, Ruth Strawn, Gladys Strawn and Florence Strawn. Grandson Ernest G. Strawn (1899- ? ) was born in about 1899 in Warren County. Granddaughter Ruth Strawn (1903- ? ) was born in about 1903 in Warren County. Granddaughter Gladys Strawn (1905- ? ) was born in about 1905 in Warren County. Granddaughter Florence Strawn (1907- ? ) was born in about 1907 in Warren County. Daughter Ella Strawn (1875- ? ) was born in about 1875 in Warren County. Daughter Effie Jane Strawn (1877- ? ) was born in about 1877 in Warren County. On Feb. 27, 1898, when she was 21 years of age, she was joined in wedlock with David Henry Shutt ( ? - ? ), son of Harrison and Catherine (Black) Shutt of Warren County. The wedding ceremony was held in the home of Effie's parents. The Shutts were farmers. They produced five known offspring -- Ralph Shutt, Edith Shutt, Verne Shutt, Glenn Shutt and Clee Shutt. The U.S. Census of 1910 shows them living in or near New Virginia, Warren County. Grandson Ralph Shutt (1900- ? ) was born in about 1900 in Warren County. Granddaughter Edith Shutt (1901- ? ) was born in about 1901 in Warren County. Grandson Verne Shutt (1903- ? ) was born in about 1903 in Warren County. Grandson Glenn Shutt (1905- ? ) was born in about 1905 in Warren County. Grandson Clee Shutt (1907- ? ) was born in about 1907 in Warren County. Daughter Hannah "Jane" Ullom (1865-1920) was born on Sept. 27, 1865. She wed Jacob H. Hughes (1850-1920) on Aug. 19, 1882, when she was age 17 and he 32. They produced seven children, among them Clara Rinehart Roberts Lemmon, Lenora Hughes, John Hughes, Albert Hughes, Lulu Hughes, Leslie Hughes and Alta Lantz. The Hugheses resided in Nettle Hill, PA in 1912. That year, they endured the untimely death of their long-suffering daughter Lenora, who had been burdened with epilepsy. Afflicted with gallstones, which caused "obstructive jaundice," Jane died at age 54 on March 13, 1920 in Aleppo, Greene County. Interment was at the Centennial Church Cemetery. Jacob only outlived her by a few months. He passed on July 13, 1920. Daughter Clara Hughes was married three times. Her first husband was Simon Westley Rinehart; her second W.M. Roberts, circa 1924; and her third Charles M. Lemmon. She and Samuel Rinehart (Feb. 7, 1881-1912) made their home on a farm in Delphene, Greene County and were considered wealthy. They did not reproduce. On the fateful day of Dec. 7, 1912, Simon was driving an automobile about three-fourths of a mile from New Freeport with passengers Robert Ullom, Benson Moninger and William Moninger. They were slowed by three teams of horses and wagons carrying timber for oil well rig construction. Samuel "sounded the automobile alarm several times as a signal for the teams to draw to one side of the road and permit him to pass which they would be required by law to do," reported the Waynesburg Republican. ...but the teamsters gave no heed to the signals, whatever. Finally, at a point in the highway where there was room outside of the regular traveled track for the automobile to pass, Mr. Rinehart drove the car by on the right hand side of the teams, which was the lower side of the road. The teams and wagons kept in the usual course of travel which was to the upper and left side of the road. The machine was safely passing and was fully four feet away from the wagons, but in passing the second team, which was being driven by John F. Benner, the latter's dog may have been touched by the car, but at least was not hurt, as it bounded out of the way with a yelp. This it is presumed enraged Renner, for he called to the men in the automobile to stop, then hurled a stone at the car. Robert Ullom who was sitting beside Mr. Rinehart saw the stone being thrown and said to the latter, "Look out, here comes a stone." By that time the automobile had passed all three of the teams and had turned up into the traveled part of the highway. As Ullom spoke, Mr. Rinehart turned his face backward so that he might see, and, if necessary, dodge the stone, as the top of the car was down and while his face was turned the car ran over an embankment about forty feet high. The automobile first passed through a wire fence then turned over twice. The Moninger boys were thrown out of the car whenit first overturned and escaped injury, but Rinehart and Ullom were carried to the bottom of the embankment. The former received a gash across the side of his face, one of his ears being cut in two, and his head was crushed, by being caught, it is supposed, beneath the steering sheel. The pressure upon his jaws had bursted several of his teeth. The badly injured Simon was carried to the nearest residence, owned by John McNeely. He never recovered, and a medical report stated the cause of death as a fractured skull and traumetic meningitis. Burial was in Centennial Cemetery. In 1924, with the name "Roberts" and living in New Freeport, she signed the Pennsylvania death certificate of her younger sister Lulu Hughes. Under the name "Lemmon," she dwelled in New Freeport in 1961. Daughter Lenora Hughes (1885-1912) was born on May 24, 1885 in Greene County. She was afflicted with chronic epilepsy and never married. As a young woman, she made her home with her parents in Nettle Hill, Jackson Township, Greene County. She died at the age of 27 years, one month and 13 days on July 7, 1912. Her remains were placed into eternal repose in Centennial Cemetery, following funeral services at the church, officiated by Rev. J.M. Murray. Son John Hughes wed Anna Hoge. Their six children were Dwayne Hughes, Wilbur Hughes, Marjorie Fry, Carl Hughes, Helena Grim and Doyle Hughes. They lived in Holbrook in 1961. Son Albert Hughes married Ollie Weimer. They had seven children -- Alma Riggs, Evelyn Throckmorton, james Hughes, Dorothy Durbin, Hazel Stockdale, Mabel Miller and Harold Hughes. In 1961, the Hugheses resided in Aleppo. Daughter Lulu Hughes (1891-1924) was born on March 11, 1891. She never married and spent her adult years in Springhill Township, Greene County. Stricken with cancer of the stomach when she was age 31, she endured the illness for two years until death on Nov. 3, 1924. Burial was in Centennial Cemetery. Son Leslie Hughes (1893-1961) was born on June 30, 1893 in Jackson Township, Greene County. He served in the American Expeditionary Force (AEF) during World War I. He married Odessa McCracken ( ? - ? ). Their five children were Jane Abel, Gerald Hughes, Byron Hughes, Eugene Hughes and Marie Grimes. The family made its residence on a farm in Graysville, Richhill Township, Greene County. Leslie was a well known school teacher for more than two decades in Jackson and Richhill Townships. The Waynesburg Republican once noted that he "had served several years as a school director in Richhill Township. He was also a member of the West Greene District School Board after it was formed through the merger of eight school districts, including Richhill Township. He was active in the Greene County Agricultural Extension Association and had been a member of the board of directors since 1943, serving as president of the association in 1957 and 1958." He also served as a board director of the Greene County Sheep and Wool Growers Cooperative Association, vice president of the Greene County Mutual Insurance Company, board of the Farm Home Association of Greene and Washington Counties, and served as a community committee member for the Greene County Agricultural Stabilization and Conservation Association. He belonged to the James Farrell Post of the American Legion in Waynesburg. Following retirement, they lived in rural Graysville. At the age of 67, suffering from leukemia and congestive heart failure, Leslie died on March 14, 1961. Burial was in Greene County Memorial Park in Waynesburg, with military rites provided by the American Legion, and the funeral conducted by Rev. Fred Cochran and Rev. Robert E. Borland. Granddaughter Jane Hughes wedded James Abel. Their home circa 1961 was in Greensboro, Greene County. Grandson Gerald Hughes resided in Graysville. Grandson Byron Hughes lived in Holbrook, Greene County. Grandson Eugene Hughes made his residence in Graysville. Granddaughter Marie Hughes married Harold Grimes. They dwelled in 1961 in Lilly, PA. Daughter Alta Hughes married Lawrence Lantz. They had one son, Robert Lantz. They lived in New Freeport in 1961. Daughter Eliza Ann Ullom (1869-1932) was born on Feb. 18, 1869 in Aleppo. On Dec. 11, 1887, when she was age 18 and he was 21, Eliza married Isaac F. McCracken (1866-1939). He was the son of David and Ellen (Thompson) McCracken of Aleppo, and a farmer at the time of marriage. The nuptials were held at the home of Eliza's mother and step-father near Aleppo, with Elder R.M. Anderson officiating. They relocated to a farm in Marysville, Union County, OH and had a family of eight children, among them Melissa Hervey, A.C. McCracken, Thomas McCracken, Frank McCracken, Fred McCracken, Mrs. J.W. Wade, David McCracken and Nellie Lucille Grimes. Their home was at 206 West Third Street in Marysville. 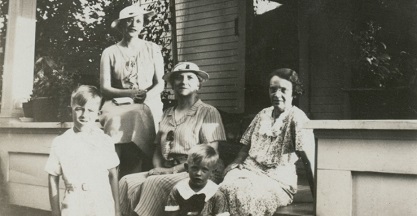 In August 1924, Eliza Ann's brother Lantz Hupp Ullom and his daughters Mildred and Thelma traveled from their home in Washington, PA for a three-day visit. The news was reported in the Marysville Journal-Tribune. They endured the death of married daughter Nellie from a blood clot or stroke on Oct. 7, 1926, at the age of 28. Eliza contracted cancer in her gall bladder and also endured hardening of the arteries. She died on Oct. 23, 1932, at the age of 63. Burial was in Oakdale Cemetery in Marysville, officiated by Rev. Noble Bodenhorn. An obituary in the Union County Journal noted that her passing followed "an illness of one and a half years with complications." Isaac lived for another seven years and married again, to Anna Owen. Circa 1937, he spent his winters in California. He died on Sept. 21, 1939. His death was tragic, from a fractured skull and internal injuries in a fall from a three story fire escape at the Columbus State Hospital. His remains were returned to Marysville for interment, with funeral services held at his son Arthur's home, led by Rev. John A. Stuart. Daughter Melissa Eleanor McCracken (1891-1958) was born on Dec. 15, 1891 in Aleppo. She married Richard C. Hervey ( ? - ? ). Their children were Leonard Glen Hervey, James Hervey, Joseph Hervey, Emelyn Payne, Richard Hervey, Claribel Moore and two infant sons. They dwelled in Marysville, Union County and were members of the Presbyterian Church, with Melissa active in the Women's Association. She also was a member of the Mizpah King's Daughters Circle. Richard earned a living hauling coal from West Virginia to Marysville. He advertised in local newspapers that he bought and hauled hay and grain and always paid the highest market prices. Tragically, son Leonard was killed on July 15, 1936 when he was seated atop a load of coal in his father's trailer truck near Wheeling, WV. Reaching to get a cushion, he fell between the front section of the truck and trailer, with with trailer wheels running over his body. Reported the Union County Journal, "The death was particularly sad and the parents and members of the family have the sympathy of all." At one point, Richard served as a Marysville town councilman. In April 1950, Richard and their daughter Claribel and son Joseph and his wife traveled to Washington, PA to attend the funeral of Melissa's uncle, Lantz Hupp Ullom, a tidbit of news captured in the gossip columns of the Journal. Melissa was admitted to Marysville Nursing Home on Feb. 5, 1958 and died there a little more than two months later at the age of 66 on April 12, 1958. Burial was in Milford Center, with an obituary appearing in the Marysville Journal-Tribune. Granddaughter Emelyn Hervey wedded (?) Payne. They lived in Milford Center, OH in 1958. Granddaughter Claribel Hervey married Leo Moore. Her home in 1958 was in Columbus, OH. Grandson Joseph Hervey dwelled in Marysville. Grandson Charles Richard Herevey made his home in 1958 in Colonia, NJ. 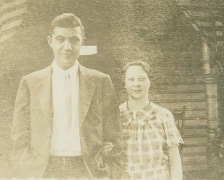 Son Arthur C. McCracken lived in the 1930s in Marysville, Union County. Circa 1926, he lived on Waldo Road. When his father died in 1939, the funeral was held in Arthur's residence on North Main Street. He remained in Marysville circa 1958. Son Thomas McCracken resided in Riverside, CA in 1926 and in San Jacinto, CA in 1932-1958. He was married and had a daughter, Betty McCracken. When the McCrackens returned to Marysville for a visit in September 1946, they were feted with a "bounteous pot luck supper" at the home of William Payne in Milford Center, with many of the extended family traveling for the meal. Son Frank McCracken made his home in 1926 in Leesburg Township and in 1932-1939 in San Jacinto, CA. By 1958, he was in Halfway, MO. Son Fred McCracken (1904?-1937) was born in about 1904. He married Marie. They did not reproduce. In 1921, when he was age 17, he and his wife, accompanied by his uncle Lantz Hupp Ullom, traveled to Mercedes, TX, where Fred was to be employed on a ranch. He was in Riverside, CA in 1926 and in Illinois in the early 1930s. Sadly, he died at the age of 33 in Indianapolis on Dec. 30, 1937, "after an illness of two years," said the Weekly Marysville Tribune. Interment was in Remington, IN. Daughter Eva McCracken attended university in Columbus circa 1926. She wedded J. William Wade. Circa 1932-1958, they dwelled in Columbus, Franklin County, OH. Eva traveled to Washington, PA in 1950 to attend the funeral of her uncle, Lantz Hupp Ullom (great-grandfather of the founder of this website). Daughter Nellie Lucille McCracken (1898-1926) was born on Sept. 13, 1898 in Greene County. She came with her parents to Marysville, Union County. On Aug. 29, 1918, at the age of 19, she was joined in wedlock with Fred Grimes ( ? - ? ). They made their home on East Fourth Street in Marysville. They were the parents of Evelyn Grimes and Dale Grimes. Tragically, she suffered a blood clot or stroke on Oct. 7, 1926, in Marysville, and succumbed at the age of 28. She was placed into repose in Marysville's Oakdale Cemetery. An obituary was printed in the Marysville Journal-Tribune. Granddaughter Evelyn Grimes (1919?- ? ) was born in about 1919. Grandson Dale Grimes (1922? ? ) was born in about 1922. Son Isaac Bailey Ullom (1870-1944) was born on Sept. 19, 1870. He was a nine-year-old boy when his father died, and evidence suggests he did not know his father's name. He wed Daisy Lyon (1875-1956), daughter of John and Mahala Lyon of Ryerson's Station, Greene County. The ceremony was held at the Walton House on Sept. 8, 1898 with Rev. James S. Jewell officiating.At the time of marriage, the 27-year-old Isaac worked as a photographer and 23-year-old Daisy as a school teacher. Their four children, all sons, were William Harold Ullom, Kenneth John Ullom, Cecil C.D. Ullom and Jennings Hupp Ullom. The family lived for many years in Washington, where Isaac was a manufacturer, and later in Cambridge, Ohio, where Isaac made a living as a contractor and machinist. They moved again in retirement to South Zanesville, Muskingum County. Isaac suffered from chronic nephritis ("kidney inflammation"). He passed away from the effects of the disease in Zanesville's Bethesda Hospital on June 2, 1944, just four days before D-Day. His remains were returned to Washington for interment. Daisy lived for another dozen years, and died on April 14, 1956. Son William Harold Ullom (1900- ? ) was born on Jan. 30, 1900. He was married twice, first to Irene Wharton. After a divorce, he wed again, to Fern Simpson. They lived in Mansfield, OH. He did not reproduce. Son Kenneth John Ullom (1902- ? ) was born on Dec. 12, 1902. He married teacher L. Alma Day of Washington. Their children were Ruth Ullom, Shirley Filcik and John Ullom. Kenneth and his brother Cecil operated an electrical products store on Main Street in Washington. Their daughter Shirley married Julius Filcik, an attorney who practiced in Washington, DC and possibly also in Cincinnati. Today the Julius Filcik Doctoral Fellowship is awarded annually to two students at Indiana University of Pennsylvania. As well, the Shirley and Julius Filcik Scholarship for Women's Basketball provides financial assistance to outstanding IUP student athletes who play for the school's women's basketball team. Son Cecil C.D. Ullom Sr. (1905- ? ) was born on July 17, 1905. He was a teacher in Washington, PA. He married Edith Tilton (1905- ? ) and had three children, Cecil C.D. 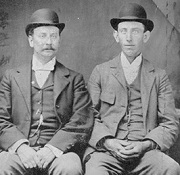 Ullom Jr., Edwin C. Ullom and David Lee Ullom. Grandson Cecil C.D. Ullom Jr. (1927- ? ) was born on June 18, 1927. He married Carol Piper (1935- ? ) of Shadyside, OH. Their five children were Debora Jean Ullom, Sandra Kay Ullom, Cecil C.D. Ullom III, Lark Ann Ullom and David Edwin Ullom. Grandson Edwin C. Ullom (1930- ? ) was born on April 20, 1930. He wed Janine Roland (1932- ? ), a native of of Digne, France. Their four children were Garth Roland Ullom, Liane Celestine Ullom, Brigitte Lorraine Ullom and Monique Collette Ullom. Grandson David L. Ullom (1937- ? ) was born on Nov. 25, 1937. He wed Yvette Lajoie (1946- ? ), a native of Fall River, MA. They had three known children -- Danielle Rolande Ullom, Lance Christian Aaron Ullom and Jason Chandler Ullom. Son Jennings Hupp Ullom (1909- ? ) was born on March 13, 1909 in Cambridge, OH. As a young man he was employed as a bookkeeper, living in Washington PA at 21 East Hallam Avenue. In about 1933, he wed fellow bookkeeper Helen Callendar of Washington. Their two children were Jack C. Ullom and Donna Jean Ullom. Jennings owned a gasoline service station on East Maiden Street in Washington. Their daughter Donna Jean was a bookkeeper at Washington and Jefferson College. Daughter Susan "Clara" Ullom (1872-1939) was born on Nov. 13, 1872 near Aleppo. She married Joshua Monroe "J.M." 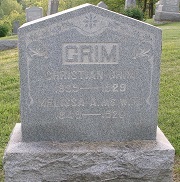 Grimm (1866-1956), the son of Isaac and Elizabeth Grim of Bristoria, Greene County. On her marriage license, Susan disclosed that she was age 18 years, and that her husband was age 24 years. Justice of the peace George Ullom officiated at the wedding, held at Aleppo on Jan. 8, 1891. They resided at 4031 Station Street in New Lynn Township near Ashtabula, Ashtabula County, OH. In 1930, when the census was taken, Joshua was a salesman for a publishing company, and 33-year-old son Glenn was a truck driver for a lumber company. The Grimms had one daughter and two sons -- among them Glenn Grimm and Ralph Grimm. Clara began suffering from a type of fever and hypertrophied thyroid in November 1937, and endured the illness for almost two years. She died on Aug. 11, 1939. On her official death certificate. Mrs. B.P. Dreyer was the informant. Burial was in Ashtabula. Joshua outlived Clara by 17 years. He passed away on Jan. 7, 1956. Son Glenn Grimm (1897- ? ) was born in 1897 in Pennsylvania. He grew up in Ashtabula, and at age 33 was unmarried and drove a lumber company truck. Son Ralph Grimm (1908- ? ) was born in 1908 in Ashtabula. He married Laura Mae (?). 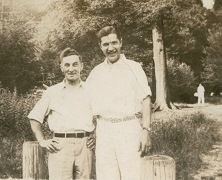 In 1936, Ullom and Miner cousins traveled to Ashtabula for a family visit, including a picnic at Conneaut Lake Park. Son Thomas H. Ullom (1878-1957) was born on April 1, 1878 near Aleppo. Early in his working career, Thomas was a building contractor and for eight years worked in the Washington County Prothonotary Office. Later, for 15 years, he owned an antique store in Washington. He was a member of the Baptist Church, and resided in Claysville, Buffalo Township on property purchased from his younger half-brother William P. and Freda Grim in 1955. Thomas died on July 28, 1957 at the Roselawn Nursing Home in Washington, at age 79. Burial was in Washington Cemetery. Thomas Ullom with his niece Mildred (Ullom) Day, Christmas 1954. On the back of this snapshot, niece Monalea (Ullom) Miner wrote: "I like this picture. Good of Uncle Tom." Melissa and Christian's daughter Flora Grim (1882- ? ) was born on June 30, 1882 in Aleppo. In 1904, at age 21, Flora married 26-year-old driller Cecil A. Snyder (1879-1932) of Worthington, WV, son of Daniel and Annie Snider. They had one daughter, Ruth Snyder. In 1920, the family resided on North Avenue in Cameron, Marshall County, with Cecil employed as a contractor of an oil field. That year, Flora's parents lived next door. next door. In 1930, Cecil was an oilfield superintendent, and they made their home on High Street. Moving back to Aleppo, they occasionally entertained visits from Flora's elder half-brother Lantz Hupp Ullom and family from Washington and Aliquippa, PA. In 1929, when named in the Waynesburg Democrat Messenger obituary of her father, she lived in Cameron. She is known to have traveled to Marysville, OH in February 1937 to visit her niece Melissa McCracken and nephew Arthur McCracken. Cecil was a "prominent business man and well known contractor," reported a newspaper. After moving to Cameron, he "took an active part in civic affairs and was a life long member of the Democratic party. he was a member of the Christian church and was a charter member of the Cameron Kiwanis Club" He also was a Shriner and a 32nd degree Mason. Melissa was active in her own right. She was a member of the Cameron Christian Church and a Past Worthy Matron of the Order of Eastern Star. Heartache shook the family on Sept. 2, 1932, when Cecil died of a heart attack at home, at the age of 52. In addition to his wife and daughter, his survivors at the time included brothers Claude Snyder and William Snyder and sisters Mrs. Mollie Thorne and Gertrude Snyder. Flora outlived her husband by many years. Circa 1950, she made her home in Aleppo Township, and was named in the news obituary of her half brother Lantz. She died at the age of 69 on Oct. 18, 1951, at home in Aleppo. The Waynesburg newspaper said she "had been in poor health but her death was sudden and unexpected." Daughter Ruth Snyder ( ? - ? ) was a dietitian at the Ohio Valley General Hospital in Wheeling, WV circa 1930. She married Wilbur Coats. In 1951, they made their home in Cheyenne, Wyoming. The Grims' daughter Eleanor "Ella" Grim (1886-1962) was born in 1886. On Sept. 12, 1908, at Waynesburg, the 22-year-old Ella was united in marriage with 26-year-old law student Sam B. West (1882-1968), son of David Keyes and Laura (Zook) West. [Sam's early life was spent in the Catile section of Morgan Township, where he also taught school before enrolling at Waynesburg College. He was a graduate of the college in the class of 1908. In college he was active in sports and played on some of the first basketball teams. He also studied law, was admitted to the bar and practiced for a short time in Waynesburg before going to California. While in Waynesburg he was one of the most active members of the First Baptist Church and held various lay offices in the church. By 1918, they moved to California and resided in Long Beach. 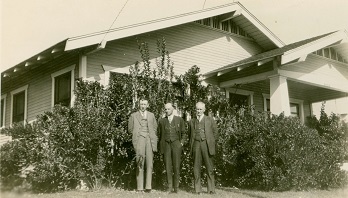 There, he was superintendent of the Atherton Baptist Home at Alhambra. Sadly, Eleanor died in Los Angeles on March 9, 1962. Sam married again, to Mary "Peggy" (?). 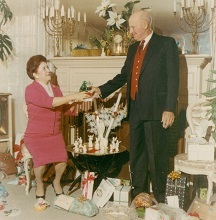 The color photograph seen here is believed to show Sam and his second wife Peggy in a Christmas gift-exchange pose, in about 1966, and was sent to Ullom relatives in Washington, PA. Suffering from a long illness, Sam died in Alhambra, CA on Nov. 4, 1968. Following a memorial service at the Merriam Chapel in Alhambra, Sam's remains were shipped back to Waynesburg for burial in Greene County Memorial Park. At his death, a lengthy obituary was published in a Waynesburg newspaper, noting that his survivors included a sister, Mrs. Challen W. Waychoff of Waynesburg, and that he was preceeded in death by a sister Emma Summersgill. The Grims' son William P. "Will" Grim (1890- ? ) was born in 1890. On May 4, 1914, at Washington, at age 24, Will wed 21-year-old Freda Fern Kuhn. At the time, William was a clerk living in Aleppo, while Freda had no occupation. Her parents were farmers Lewis and Mary (Huffman) Kuhn of Aleppo. They are thought not to have reproduced. His home in 1929 was Aleppo, and the census of 1930 shows them there, making a living as farmers. Occasionally he entertained visits from his elder half-brother Lantz Hupp Ullom and family from Washington and Aliquippa, PA. In 1950, he resided in Cameron and was named in the newspaper obituary of his half brother Lantz Hupp Ullom. They sold a tract of land in 1955 to William's half-brother Thomas H. Ullom.